‘Dfcu quick banking’ is a newly launched electronic banking platform that allows customers to access several banking services through both the internet and their mobile phones. The bank is also in the advanced stages of rolling out agency banking that will allow a third authorized party to offer banking services on behalf of dfcu Bank in rural areas. According to Lloyd Jonathan Busuulwa, Head of e-banking at dfcu, the bank is strategically working towards reinventing itself as the next generation bank in Uganda as technology evolves and the dependence on physical banks begins to diminish. 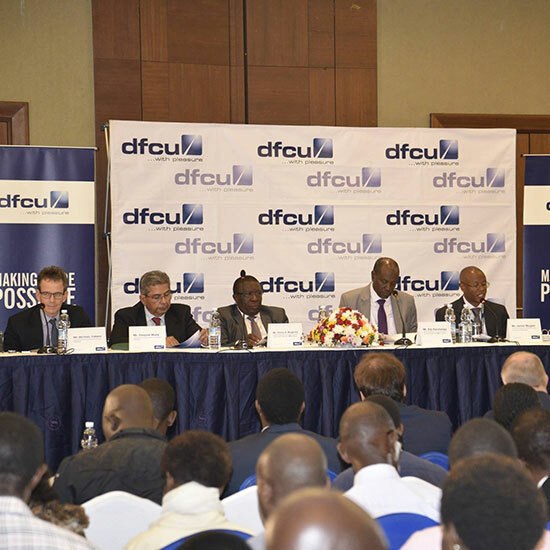 Busuulwa notes that dfcu understands that with the ever-evolving technology, the traditional banking model where a “branch is king” could possibly become redundant in the future. Therefore, banks need to embrace and build online banking systems that advance digital banking on the continent. He added that the strategy will enable the bank to reach the underserved and unbanked population and enhance government’s agenda in financial inclusion. “The bank has registered tremendous improvement in terms of its operational efficiency and customer care relations. An increase in customer touch points has given the bank a new look and will contribute to dfcu being one of the most efficient and reliable banks in Uganda”, he added. The technological innovations that the bank has put in place has made banking possible everywhere, any time. In 2017, DFCU enhanced its operational capability and upgraded the core banking platform to Finacle 10, giving it more scalability, agility and security as a basis for expansion, innovation and increased automation of end to end customer experiences. To make the digital banking experience seamless for customers, the bank has put in place a call centre that is available 24/7. In addition, dfcu has further outsourced specific services to outbound call centres to ensure consistent and seamless communication channels between the bank and its customers.